Discussions surrounding the roles of men and women--whether in the church, the home or society at large--never seem to end, often generating more heat than light. Such debate is still important, though, because this issue directly affects every member of Christ's body. What we believe the Bible teaches on these matters shapes nearly all we do in the church. In addition, these questions deserve further thought and reflection because neither side has won the day. 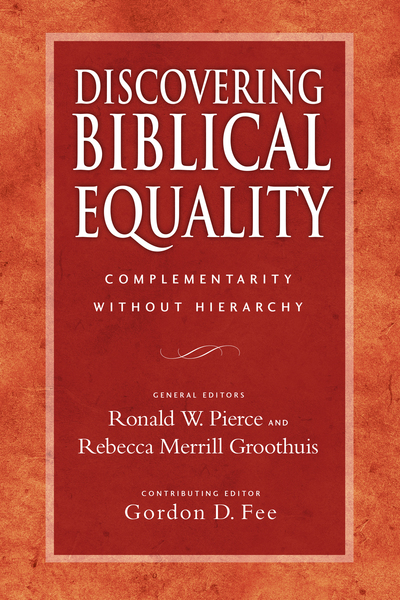 In an effort to further discussion, Ronald W. Pierce and Rebecca Merrill Groothuis (general editors), with the aid of Gordon D. Fee (contributing editor), have assembled a distinguished array of twenty-six evangelical scholars firmly committed to the authority of Scripture to explore the whole range of issues--historical, biblical, theological, hermeneutical and practical. While dispelling many of the myths surrounding biblical equality, they offer a sound, reasoned case that affirms the complementarity of the sexes without requiring a hierarchy of roles. Contributors include Ruth A. Tucker, Janette Hassey, Richard S. Hess, Linda L. Belleville, Aída Besançon Spencer, Craig S. Keener, I. Howard Marshall, Peter H. Davids, Walter L. Liefeld, Stanley J. Grenz, Kevin Giles, Roger Nicole, William J. Webb, Sulia Mason, Karen Mason, Joan Burgess Winfrey, Judith K. Balswick, Jack O. Balswick, Cynthia Neal Kimball, Mimi Haddad, Alvera Micklesen, R. K. McGregor Wright and Alice P. Mathews. Here is a fresh, positive defense of biblical equality that is at once scholarly and practical, irenic and yet spirited, up-to-date and cognizant of opposing positions.